The average adult daily energy intake is 8700kJ. 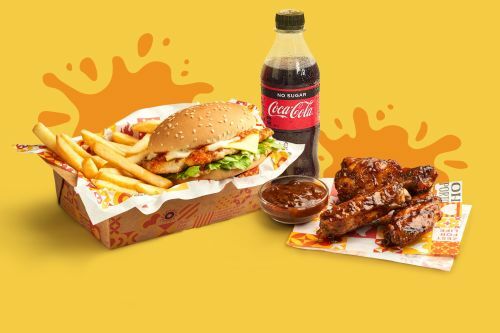 Menulog delivers for Oporto - Norwest so you'll be able to track your courier on a map. 12 x single fillet bugers. Choose from Bondi with or without chilli, Oprego, Otropo or a combination of all 4. Please allow for extra time for these catering packs! Mini Chicken wrap in 4 x Chilli Sauce, 4 x Garlic Sauce, 4 x Prego Sauce and 4 x Lemon and Herb Sauce. Please allow for extra time for these catering packs! 8 Chicken Rappas in 2 x Chilli Sauce, 2 x Garlic Sauce, 2 x Prego Sauce and 2 x Lemon and Herb sauce, each cut in half. Please allow for extra time for these catering packs! 5 whole chickens and 5 share sides. Please allow for extra time for these catering packs! Two fresh-grilled 100% chicken breast fillets, crisp lettuce, cheese, creamy mayo and Oporto's legendary chilli sauce. With Single Chips and 600ml Drink. Three fresh-grilled 100% chicken breast fillets, crisp lettuce, cheese, creamy mayo and Oporto's legendary chilli sauce. Two fresh-grilled 100% chicken breast fillets, crisp lettuce, fresh tomato, cheese, mayo and Oporto's deliciously tangy prego sauce. Two fresh-grilled 100% chicken breast fillets, juicy pineapple, sizzling bacon, cheese, lettuce and Oporto's own creamy mayo. Three fresh-grilled 100% chicken breast fillets, juicy pineapple, sizzling bacon, cheese, lettuce and Oporto's own creamy mayo. With two fresh-grilled 100% chicken breast fillets, sizzling bacon, fresh tomato, lettuce, cheese and creamy mayo. Our Veggie Burger is served with fresh lettuce, tomato, cheese, mayo and lemon and herb sauce. To find out more on the nutritional and allergen information of our menu, go to www.oporto.com.au. Please use the comment box upon check out for additional requests such as extra sauce, no sauce, light chilli, etc. A quarter of a succulent chicken, flame-grilled flat and brush-basted with your choice of Chilli or Lemon and Herb sauce. Half a succulent chicken, flame-grilled flat and brush-basted with your choice of Chilli or Lemon and Herb sauce. A whole succulent chicken, flame-grilled flat and brush-basted with your choice of Chilli or Lemon and Herb sauce. With two fresh grilled chicken tenders, tomato, lettuce, creamy mayo and your choice of sauce - all in a warm pita bread wrap. Large pita, creamy slaw, spicy rice, pulled chicken & jalapeno & lime sauce. A 5-pack of lightly marinated 100% chicken breast tenders, freshly grilled and served with your choice of sauce. Hot off the grill 100% chicken tenders served on a bed of crisp premium lettuce mix, fresh tomato and olives & creamy mayo. Lettuce, creamy slaw, spicy rice, grilled corn, Portuguese tomato salad, pulled chicken & guacamole. A 5-pack of bite-sized 100% premium chicken pieces, served with your choice of sauce. An 8-pack of bite-sized 100% premium chicken pieces, served with your choice of sauce. Cooked until golden brown and lightly seasoned. To find out more on the nutritional and allergen information of our menu, go to www.oporto.com.au.